Yesterday's New York Times ran another article about how women are trading down, or "shopping their closets": Irresistible and Affordable, by Eric Wilson. If the (comparatively) free spending is over, what to do? We are not about to default to H&M! Buy one perfect piece that works with what you already own, and you'll lift your wardrobe to a stylish spring lightness. Often, a single piece breathes new life into your old favourites, and returns more value and pleasure than an armful of so-so buys. Day Birger and Mikkelson chiffon dress, $180 from Net-a-porter to wear to everything from graduations to lawn parties. 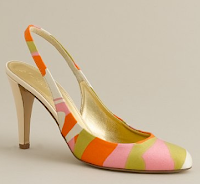 Cate patterned high-heel slingbacks, J. Crew, $228. Vaults neutrals into spring. 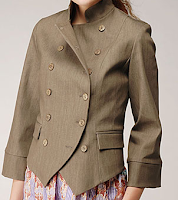 Lafayette 148 silk dupioni blouse, on sale, $208.50 (see the Sale page on their web site), to spark your favourite pants or pencil skirt. Nicole Miller brown denim, $365, an unexpected update for your jeans and tee. 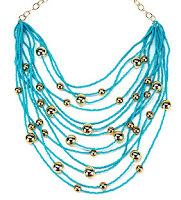 Greenbeads multi-strand turquoise necklace with gold vermeil beads, $110 from Fragments. Fills in the neckline of everything you own, and adds a pop of blissful blue. If money is tight - what are the holes in your wardrobe? What will you get the most value from? What will make your wardrobe work better, allowing you to create multiple more outfits from clothes you already own? Rather than buy an orphan, make sure it's long lost family. Great choices, Duchesse! I love all of those. Imogen, love the orphan/family analogy! Some nice examples here, Duchesse. I bought a new pair of shoes last week that will add pizzaz to many outfits and thus earn their keep. I love that I don't really need anything right now so I'm free to wait 'til I find the kind of item you're describing. I love Imogen's analogy -- I'm going to keep an eye out this weekend for longlost family and if I find them, it will be "Come Home to Mama!" Boy would I love that dress, but unfortunately on someone else. I know I'm supposed to be "me" but what I would give to be the gal who graces that dress and it graces her. In the meantime, I've been searching for a cotton jacket in that color and it never occurred to me to think of brown denim! Imogen: I hope for the delightful long lost family, one who turns out to be interesting and fabulous. Last item like this: a silk chiffon kimono- type top that works as an overlayer or as a blouse (over a cami), in most seasons. Vildy: Cocoa-brown denim is fresh; I like white, too, but I drop things on it! ma: Post those shoes, will you please? Pseu: Thanks, was thinking of your post on ennui, hope this helps! It certainly does help! I'm intruiged by that jacket but can't find it online anywhere. My problem is that I can never decide on the one perfect piece. I like too much still. I agree with Frugal Scholar. I can't decide on one perfect piece. These are nice choices, though. I love the dress, though sleeveless is not for me. I´d place my money and even some more on a fine bag. The bag would be the center piece of my outfit for today, tomorrow and forever. I think if I had to pick from your choices -- I'd pick the statement necklace. I don't know why -- just that it draws me to it. I think I'd wear it dressed up or down. My one splurge last season was a gorgeous pair of wedge boots I was longing for. I felt like a million dollars every time I wore them no matter how the day went.